A plant’s ability to maintain an optimal cytosolic K+/Na+ ratio has long been cited as a key feature of salinity tolerance. As traditional whole-leaf nutrient analysis does not account for tissue and organelle-specific ion sequestration, the predictive value of this index at the whole-plant level is not always satisfactory. Consequently, suitable in situ methods for functionally assessing the activity of the key membrane transporters contributing to this trait at the cellular level need to be developed. The aim of this work was to investigate the extent to which plasma membrane transporter-mediated Na+ exclusion and KOR-mediated K+ retention traits, measured with the microelectrode ion flux measuring (MIFE) technique, are inheritable in wheat, and whether the MIFE technique has the potential to be used in combination with molecular markers to determine QTLs for these transporter proteins. 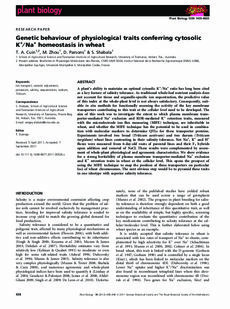 Experiments involved two bread (Triticum aestivum) and two durum (Triticum turgidum) wheat lines contrasting in their salinity tolerance. Net Na+, K+ and H+ fluxes were measured from 6-day-old roots of parental lines and their F1 hybrids upon addition and removal of NaCl. These results were complemented by assessment of whole-plant physiological and agronomic characteristics. We show evidence for a strong heritability of plasma membrane transporter-mediated Na+ exclusion and K+ retention traits in wheat at the cellular level. This opens the prospect of using the MIFE technique to map the position of these transporters on particular loci of wheat chromosomes. The next obvious step would be to pyramid these traits in one ideotype with superior salinity tolerance.